www.SugarProducer.com 25 l IRRIGATION ACCESSORIES CO. (IACO) (360) 896-9440 www.boombacks.com BOOMBACK AUTOMATION In conjunction with FluidPulse and its ValveCommander latching solenoid, IACO has achieved a breakthrough in bringing a dry wheel track solution to wipers, linears and center pivots that alternate directions. e ValveCommander replaces two three-way solenoids with a single four-way solenoid. is enables the use of much simpler valves, reducing friction loss and overall cost. IACO has engineered a reliable switching system, wired into an existing tower box, that activates the trailing set of Boombacks. When the pivot changes direction, the first set turns off, and the now-trailing set of Boombacks turns on. 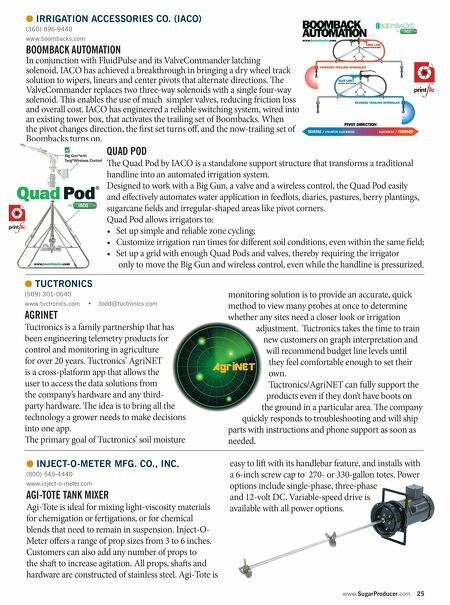 QUAD POD e Quad Pod by IACO is a standalone support structure that transforms a traditional handline into an automated irrigation system. Designed to work with a Big Gun, a valve and a wireless control, the Quad Pod easily and effectively automates water application in feedlots, diaries, pastures, berry plantings, sugarcane fields and irregular-shaped areas like pivot corners. 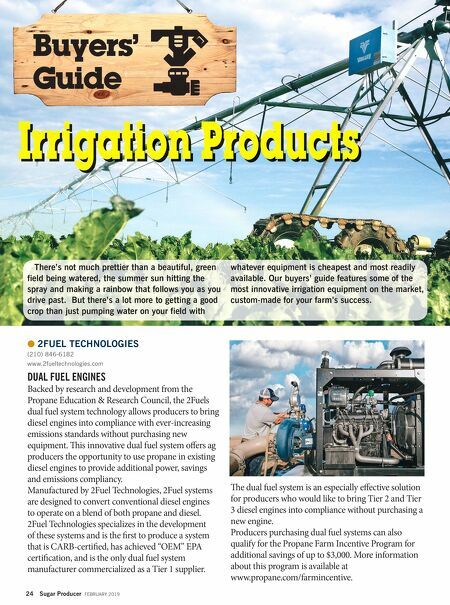 Quad Pod allows irrigators to: • Set up simple and reliable zone cycling; • Customize irrigation run times for different soil conditions, even within the same field; • Set up a grid with enough Quad Pods and valves, thereby requiring the irrigator only to move the Big Gun and wireless control, even while the handline is pressurized. l TUCTRONICS (509) 301-0640 www.tuctronics.com • todd@tuctronics.com AGRINET Tuctronics is a family partnership that has been engineering telemetry products for control and monitoring in agriculture for over 20 years. Tuctronics' AgriNET is a cross-platform app that allows the user to access the data solutions from the company's hardware and any third- party hardware. e idea is to bring all the technology a grower needs to make decisions into one app. e primary goal of Tuctronics' soil moisture l INJECT-O-METER MFG. CO., INC. (800) 545-4440 www.inject-o-meter.com AGI-TOTE TANK MIXER Agi-Tote is ideal for mixing light-viscosity materials for chemigation or fertigations, or for chemical blends that need to remain in suspension. Inject-O- Meter offers a range of prop sizes from 3 to 6 inches. Customers can also add any number of props to the sha to increase agitation. All props, shas and hardware are constructed of stainless steel. Agi-Tote is easy to li with its handlebar feature, and installs with a 6-inch screw cap to 270- or 330-gallon totes. Power options include single-phase, three-phase and 12-volt DC. Variable-speed drive is available with all power options. monitoring solution is to provide an accurate, quick method to view many probes at once to determine whether any sites need a closer look or irrigation adjustment. Tuctronics takes the time to train new customers on graph interpretation and will recommend budget line levels until they feel comfortable enough to set their own. Tuctronics/AgriNET can fully support the products even if they don't have boots on the ground in a particular area. e company quickly responds to troubleshooting and will ship parts with instructions and phone support as soon as needed.